Koshka is a jungler who excels at sneaking up on her enemy's and taking them down with her ability to chase and burst down heros. She is capable of sneaking up on heros and bursting them down before they are capable of doing much damage to her but does not do well when she is engaged upon. She is one of the most fun heros to play in my opinion and a great choice when building team comps around ranged laners. One of the most important items for Koshka is her first item Aftershock. It is important to rush this item because it will help you win more team fights early game. After you pick up this item it is a good idea to start building defense due to her naturally low health due to her being an assassin. Im a strong believer that it does not matter how much damage you can do if you can't stay alive to deal that damage. 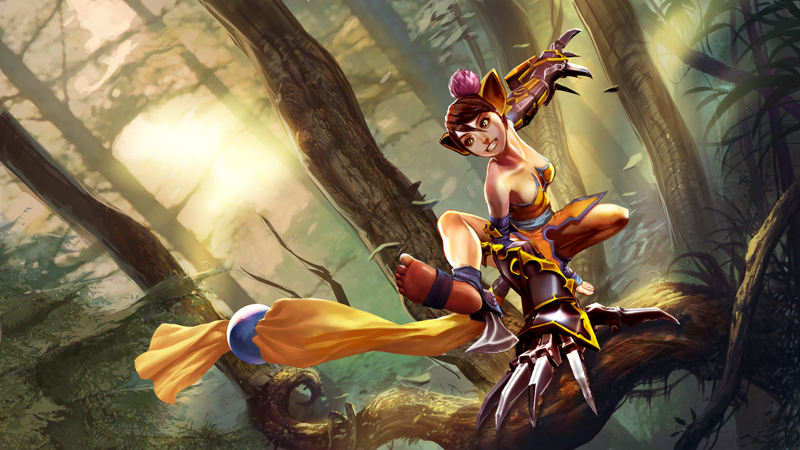 Another important thing to remember with Koshka is that she is a jungle assassin who excels at jumping into team fights a dealing a lot of damage. In order to do this without dying you must remember to build two defensive items and that's why I recommend both Light Armor and Light Shield. I recommend upgrading your boots to Travel Boots after you have these items only if you feel like you have the upper hand. My second offensive item tends to be Shatterglass for a few different reasons. The most important of these reasons is that her kit is tailored around jumping into team fights and dealing a lot of damage and then letting your team come finish them off. That's what shatter-glass is a great second item because it allows her to deal a ton of damage right off the bat rather than waiting to get your stacks up with Broken Myth. I do however feel like after you complete your Aegis and Metal Jacket that Broken Myth is a solid last item to help you scale into the late game. I highlighted some of the key points in previous sections but I want to bring everything together and offer you a little insight on how to play this hero. One of the keys that allowed me to master Koshka is getting in the mindset that she is an assassin in every aspects of the word. She is capable of sneaking through bushes while she seeks to pounce on her enemy's but this also leaves her weak and vulnerable when her enemy's engage her. Early game is when Koshka is her strongest. If you have a hero like Ardan or Fortress who deal lots of damage early game it would be a good idea to invade the enemy jungle early in the game. If you can take the advantage early game and continue to keep that lead and make it snowball into late game you have a pretty good chance of winning. Make sure you do the engaging because the more damage that you can put out before they have a chance to realize what's going on means you have a better chance at winning the fight. But keep in mind you are not invincible so keep a few Halcyon Potion on you and pull out if you think you are going to loose the fight but still think you have a chance at escaping. Mid game is where you want to extend that early game advantage. If you used your early game to your advantage then a mid game Koshka can still be very powerful. When you get your ULT Yummy Catnip Frenzy make sure you use this to help gank the enemy laner or if you get the chance to catch the enemy jungler off guard. Be aware that a well times Reflex Block can cancel out your ULT so make sure you time it right. I have found that if you wait and engage with your A instead they will sometimes pop the Reflex Block and allow you to stun them afterwards. Late game is when Koshka stars to fall off. If you can snowball it enough from early game you can carry that all the way to taking the vain! If not however you will have to work harder in order to be able to do that. The most important thing to remember late game is that it takes much more team work and synergy in order to come out on the winning side of the battle. You as the semi-carry need to get in right behind your roamer (do not jump out in front of your roamer because even with that much defense you will still take a ton of damage) and follow them into the heart of the team fight. Every ability has to be planned and executed properly. Because you have fell off compared to some of the other heros that scale better into late game every ability will count. Do not waste any of your abilities on the roamer unless you can use your A to catch up to them and then land your ULT on their carry or semi-carry (preferably the carry AKA the hero doing the most damage which is normally the laner). Try to do as much damage as you can to the enemy carry and try to land a stun on them if you can. You will probably die and that's ok but the most important thing is to remember that you are trying to lower their health by enough to allow your roamer and carry to finish them off and get the ace. It has been a pleasure writing this guide for you all! I hope that you all of you decide to go purchase this hero if you haven't already. She is one of the most fun heros that I have had the pleasure to play and she does very well in team comps with a ranged late game laner like CP Vox and Skaarf. I hope you will be able to use this guide as a reference to become the best Koshka player out there. If you have and suggestions or things you would like me to add please comment and I will be sure to work on that. Thank you all for taking the time to read my Koshka guide. If you enjoyed it and found it helpful plus don't forget to give it a thumbs up! My IGN is ShaDaz and I am the Senior Analyst for the VainStars community. I have been playing Vainglory since it was released and intend to analyze every hero and mechanic of the game. I enjoying trying new builds and mastering different heros so if there is a hero that you want to see please feel free to comment. If you would like to stay up to date on new material and be apart of a great community of players feel free to join our VainStars community.